Jersey pistol shooter Nikki Holmes has her eyes set on making the 2018 Commonwealth Games after admitting that she now feels like she belongs at international level. Holmes shot for Jersey at the 2014 Games in Glasgow before claiming four golds at the Island Games in 2015. She came sixth at the recent British Airgun Championships, in an event won by Olympian Georgina Geikie. "When I first started shooting it was quite nerve-wracking," said Holmes. "You think 'Why am I here? I don't deserve to be here' but then they make mistakes just like everyone else. "You have to remember they're just as nervous as you are, even though they don't look it and tend to control their outwards appearance much better." At Glasgow 2014, Holmes finished 14th in qualifying in the 10m air pistol event and, despite coming fourth in the 25m pistol precision qualifying, she missed out on the latter stages after struggling in the rapid fire section. "At the Commonwealths in Glasgow, when I went there I didn't think that I belonged there," she told BBC Radio Jersey. "I know I didn't do as well as I wanted to but, in one of my competitions, I was doing really well and was right up there, so that's been a real confidence boost and that helped with the Island Games as well. "To get fully fit and to qualify for the Commonwealth Games is my big target for the next couple of years. I really should make the final next time." Holmes, 45, who has recovered from recent elbow and back injuries, now hopes to leave the island more often to compete in international competitions, en route to that place in Jersey's squad for the Commonwealths on Australia's Gold Coast. 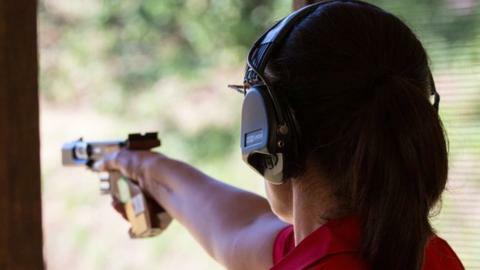 Despite her dad being a police firearms officer, she only took up the sport in her late thirties, and now admits she should have given it a try earlier in her life. "I do regret it a little bit, but I didn't have the opportunities then," she said. "It's a great sport, it really develops your concentration and your focus. "My dad was a shooter but it was more of a boys thing and a police thing."